Every detail counts, from the moment a component arrives at a goods-in bay, to the moment a finished item is shipped. 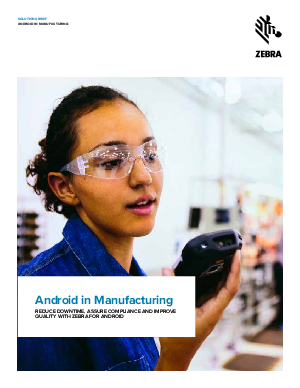 Mobile technologies are rapidly moving into every area of manufacturing, but it is in traceability, quality assurance and process compliance that mobile computers are making the most immediate impact. Industry 4.0 is adding momentum, with machine-to-machine communication and increasing automation, driven by digital technologies. In this scenario, accurate data capture and real-time collaboration between teams become critical concerns. With global competition and perpetual economic volatility, margins are under continuous pressure. Customers expect outstanding just-in-time service, while demanding rock-bottom prices. Every second of downtime saved, and every small efficiency gain, can quickly add up to significant competitive advantage.